I have a hydraulic dump trailer and it’s a single acting hydraulic cylinder (Hydraulic up and gravity down) – 3 wire hydraulic pump control. I was at the city dump and was dumping wood that can be burned. They sent me into a building where I can dump my trash to be burned. Inside is dark and the floors are extremely dirty – slushy filth rather. If I didn’t have floor mats – my truck would still smell like the dump. I figured next time when I come to dump, I would have a wireless remote so I could dump while in the cab. I ordered Tuff Stuff Wireless Winch Remote Control Kit from amazon. I also ordered another relay to power the pump. Relay is to the right. I need to mount the box outside so I can get better reception. Works good so far! 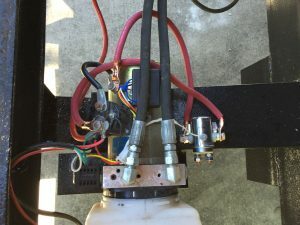 -White up – connected to the top of new relay to turn on the motor.